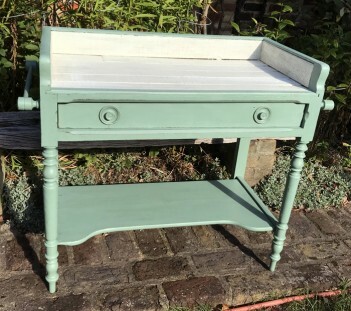 This is a lovely example of an antique pine French washstand. We replaced the missing drawer runner, so the drawer now works and painted the body in Charleston Green and the top in Vanille. We sanded it to distress it, then varnished the whole piece. Everything is original, the towel hangers either side and the shelf, personally I love the inset handles on the drawer.